People with disabilities who have spent nearly 36 hours on the street so far have decided to suspend their outdoor campaign for 12 hours so that it can be re-ignited. It will resume tomorrow at 10 am outside the gates of Dáil Eireann on Kildare Street in Dublin. Up to now, the protesters have been located outside Government Buildings on nearby Merrion Street. The decision to suspend the campaign was taken after what lead campaigner and Director of Áiseanna Tacaíochta (ÁT), Martin Naughton, described as a disappointing outcome to the group’s meeting with An Taoiseach Enda Kenny. After several hours of discussion, Mr Kenny said that he would meet the campaigners again in three months. 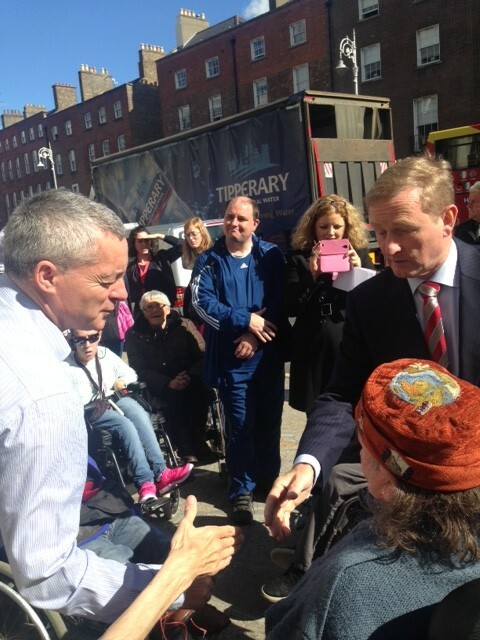 Naughton said that this sends a message that the rights and values of people with disabilities can wait.